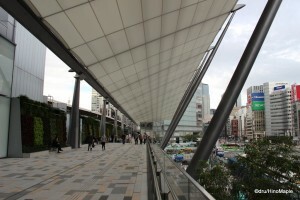 The Tokyo GranRoof recently opened, on September 20th on the Yaesu side of Tokyo Station. The GranRoof is the new “jewel” of Tokyo Station that is meant to help modernize Tokyo Station. 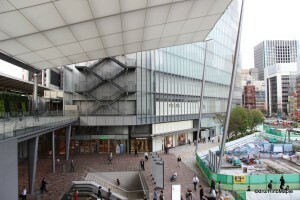 Last year, the new Marunouchi building opened up on the west side of the station, and that was followed by a simple make-over of the east side, the Yaesu side. I had a lot of expectations of this new area, but I was thoroughly let down. The roof is definitely beautiful but the idea that it is a spectacular place is a little misleading. It is a great opportunity but I think they missed the mark completely. My expectations may not be what they were planning, but when I heard that there would be a platform right next to the Shinkansen, I was imagining a great vast area where you could look closely at the Shinkansen all day long. Unfortunately, you are about 1 floor too low to see the Shinkansen, and the entire side is walled with nice plants. I did enjoy the plants but to imagine the roof as being a wonderful addition to Tokyo Station, I would call it a missed opportunity. While this may seem like a completely missed opportunity, the GranRoof is not a bad place at all. It is a simple modernist outdoor roof that is now being used to create a nice long plaza on the Yaesu side of Tokyo Station with various shops held within the building itself. The roof itself is pretty grand and it does add to the aesthetics of the station itself. I think the station over hyped the opening and the usefulness of the GranRoof and putting “Gran” into the name, akin to calling it grand, is misleading. I haven’t had a chance to check out any events so far, but I did hear that there is a small flower display on the GranRoof and I will try to check it out by the end of November. Hopefully they will keep adding new events to the GranRoof to make it worthwhile to visit often. While the GranRoof area itself is a bit of a letdown for me, do understand that below the actual roof is a shopping arcade that has been updated as well and potentially a few other restaurants that I didn’t see. I didn’t know too much about the GranRoof area and I thought the GranRoof Terrace was the main attraction. After researching the GranRoof in more detail, I found out that I missed a significant portion, but that portion appears to just be a shopping and restaurant area, so I’m not expecting it to be very interesting. Once you have been to one shopping area, especially in the Tokyo Station area, it is all pretty similar. This entry was posted in Tokyo and tagged Gran Roof, Grand Roof, GranRoof, GranRoof Terrace, japan, tokyo, Tokyo GranRoof, Tokyo Station, Yaesu by Dru. Bookmark the permalink. So … it’s open? No glass walls to protect you against rain or wind or whatnot?